Club meetings are usually held on the first Saturday of each month in Kingwood. Refer to the Monthly Meetings page and the ​Calendar of Events page for more information and directions. Join us for our Sunday Evening TEAC Club Net, 8:00 PM on the TEAC VHF 1 repeater (145.430) for the latest TEAC information and the weekly ARRL audio news. 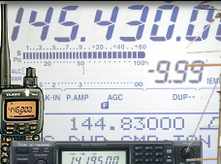 Join the South Texas ARES District 14 Northeast Net​ on Thursday nights also at 8:00 PM, TEAC VHF 2 repeater (147.280). The club funds and operates repeaters located in Kingwood, Humble and Atascocita, Texas. Refer to the TEAC Repeaters page for more information. Join us for conversation, fellowship and a good meal. A small group of us gather weekly on Friday and Saturday for breakfast and on the last Wednesday of month for lunch. Refer to our Breakfast and Lunch page for more information.